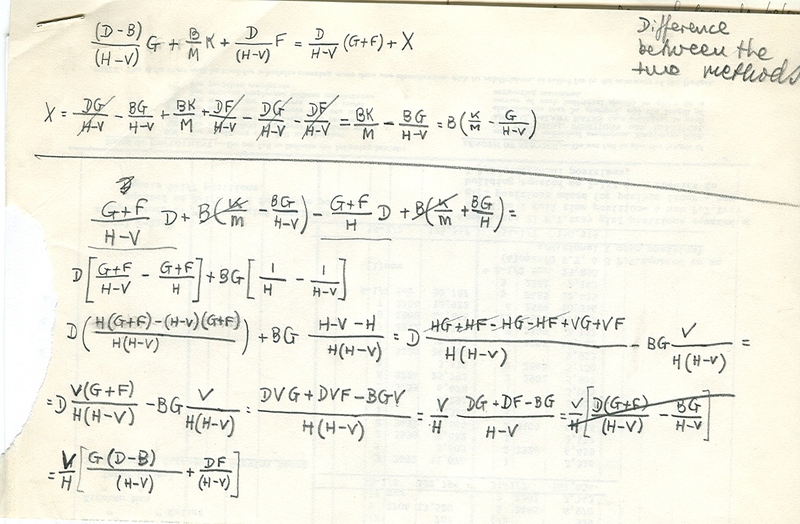 An interesting note containing only algebraic calculations turned up recently in the Budget files, perhaps calculated by Jack Applebaum or by someone who worked for him as Assistant Budget Director or between 1971 and 1977 when he was Budget Director. It is titled, “Difference between the two methods”. It’s unclear what the two methods were or which one won out. A little bit of lightheartedness for a Friday. 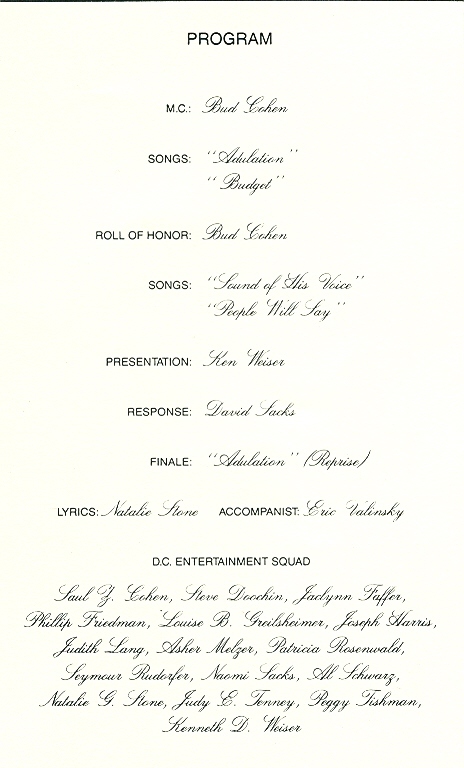 The tune, accompanying lyrics, and the creation of the D.C. Entertainment Squad for the party provide insight into another side of UJA-Federation’s Distribution Committee. Lurie was for many years the Executive Director of the Bureau of Jewish Social Research in New York, which was a forerunner of CJFWF, of which Lurie was also Executive Director. Many of his publications from the 1930s are available online from the Berman Jewish Policy Archive at the Robert F. Wagner Graduate School of Public Service at New York University. 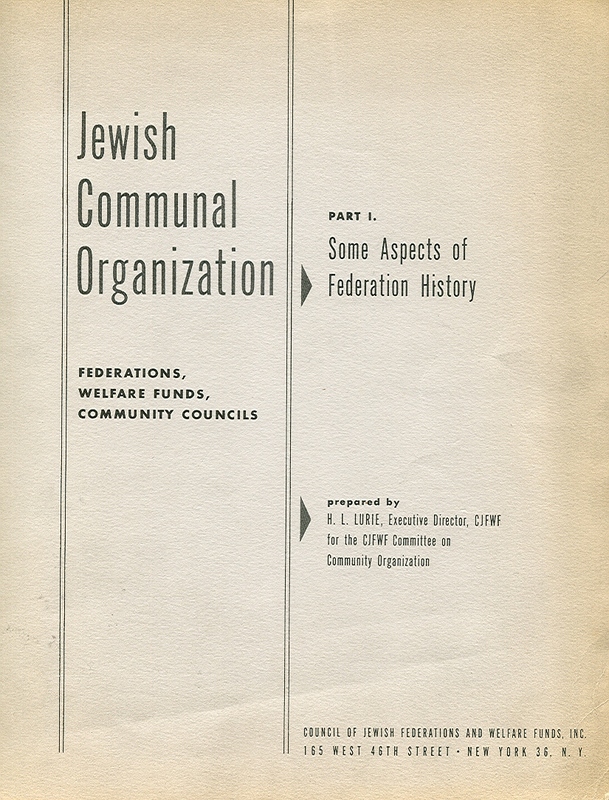 This report, because it was published by CJFWF, will be transferred from the UJA-Federation of New York collection to the CJFWF collection, I-69, also at the American Jewish Historical Society. Within the files created by the Budget Department at FJP, in addition to hundreds of boxes of Annual Agency Files, Financial Reports and other final documentation of the FJP budget over 70 years, there are many boxes (probably 40-50 or more once we’re done) that simply fall into a subseries we are calling, “Budget Department Subject Files”. 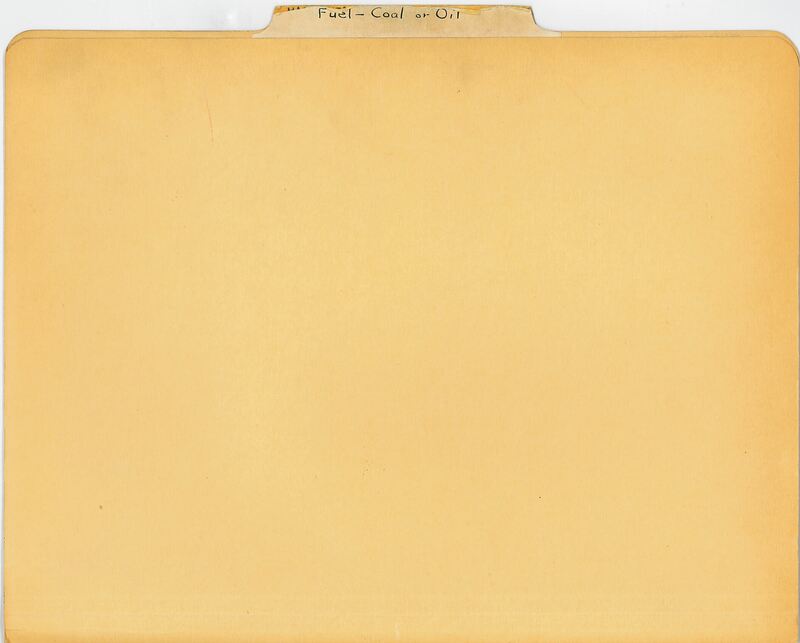 Within these Subject files is a diverse assortment of topics, in folders that sometimes contain 40 years’ worth of documents on one subject. This attests to the Budget Department staff’s consistency in indexing, filing and workflow through the decades, due at least in part to the longevity in tenure of many employees of the Budget Department, particularly under the directorship of Jerome Saltz. One example is a folder labeled in neat penmanship, “Fuel – Coal or Oil”; the date range of the documents extends from 1925 through 1949. 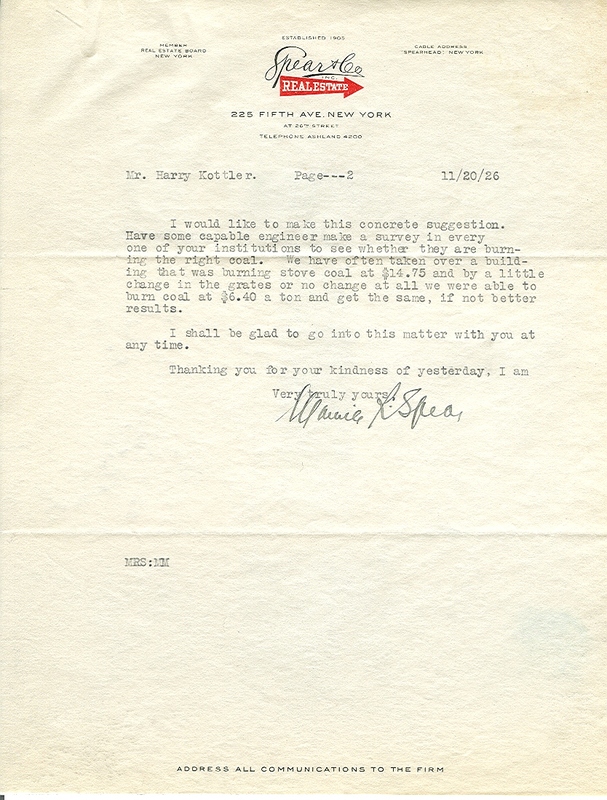 In the folder there is a 1926 letter from Maurice R. Spear, Treasurer of Spear & Co., Inc. Real Estate, quoting coal prices to Mr. Harry Kottler of Federation. In 1926 the Budget Director at FJP was Solomon Cutler; Mr. 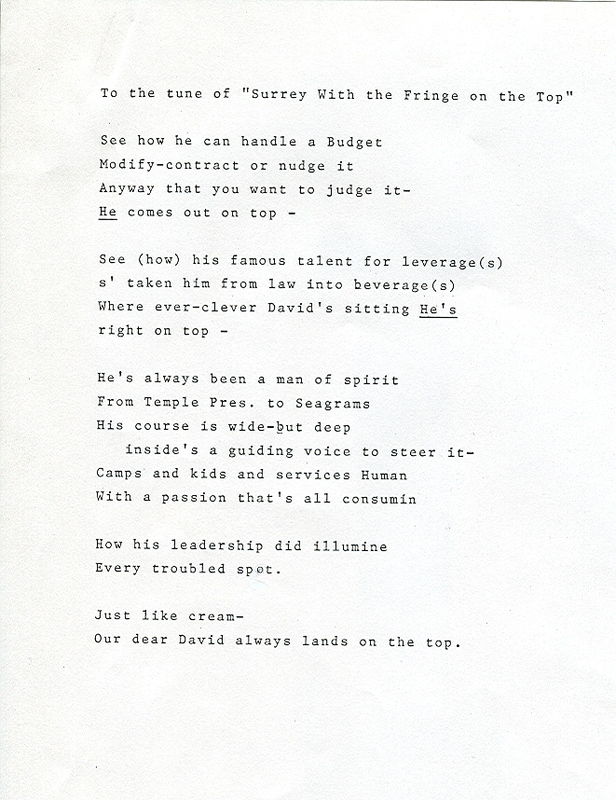 Spear seems to have been misinformed about the spelling of his name – hopefully the prices quoted were more accurate. The coal prices are based on various sizes and qualities of coal – pea coal, nut coal, stove coal, soft coal, coke, etc. We don’t have a copy of Solomon Cutler’s original inquiry to Spear & Co., but presumably it was a general inquiry as to cost for the winter of 1926-1927. 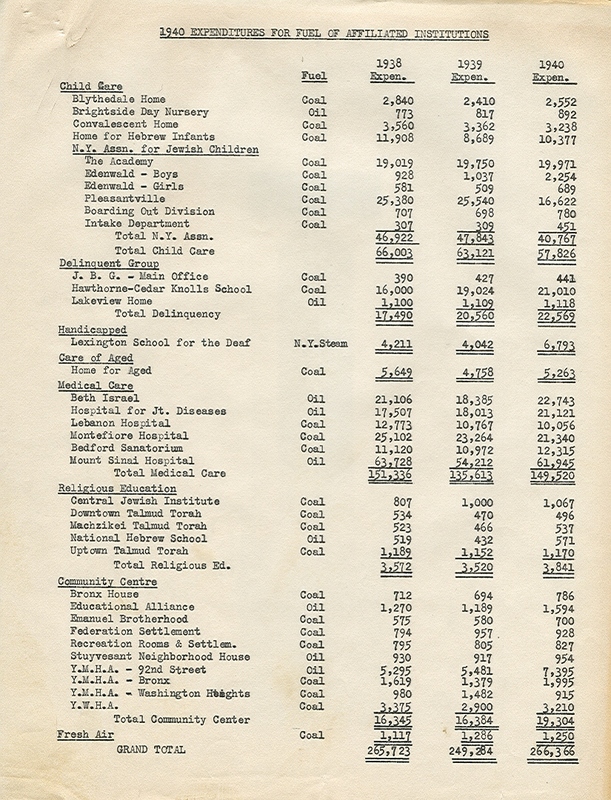 In 1940 the Budget Department prepared a chart showing the cost of fuel, whether coal or oil, by agency, arranged by Functional Groups, comparing costs in 1938, 1939 and 1940. Perhaps this study was again because of the high cost of fuel and a planned discussion on whether to convert more institutions to oil from coal. Most agencies on this list were still using coal in 1940. By 1942 the United States government was strictly controlling the availability of oil for non-residential buildings, and there was correspondence between Maurice Hexter, Executive Vice-President of FJP, and the presidents of many of the non-residential agencies as to the possibility of their converting quickly back to coal. Coal was thought at that time to not be as efficient, and the conversion costs back to coal burners were not necessarily trustworthy. 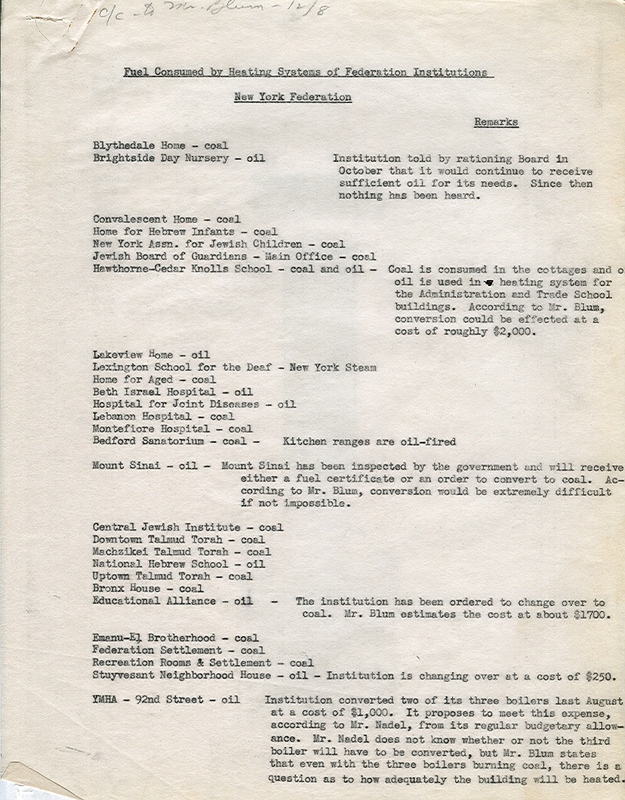 Below is page 1 of a memo with information arranged by agency with remarks as to whether they would “continue to receive sufficient oil for its needs” and if not, then an estimate as to the cost of conversion to coal. It’s not clear from the file if any conversions back to coal took place; there is a gap in the folder from 1943-1948. By June 1949 there were just 8 Agencies listed still using coal. (By comparison, an article in the New York Times from 1995 states that 25% of New York City’s schools still used coal 50 years after this study.) 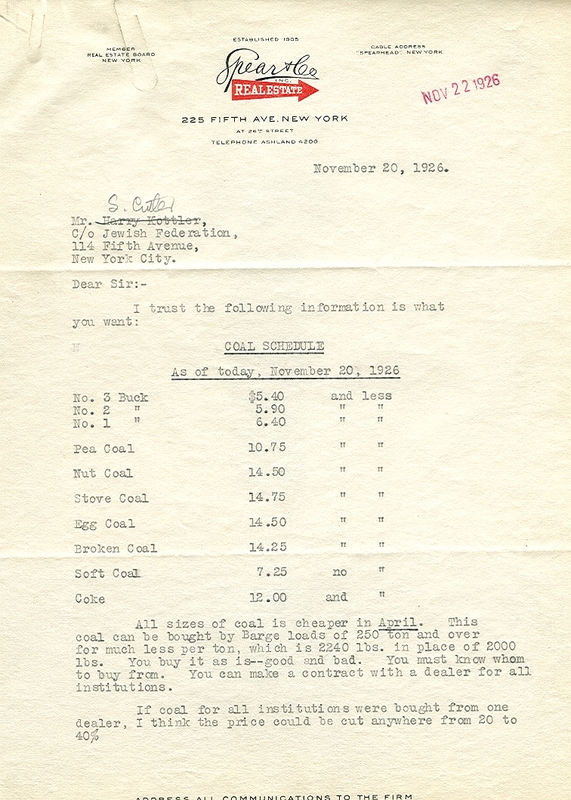 In 1949, the focus on fuel in Federation’s Budget Department had shifted from the availability of coal to the price of oil. 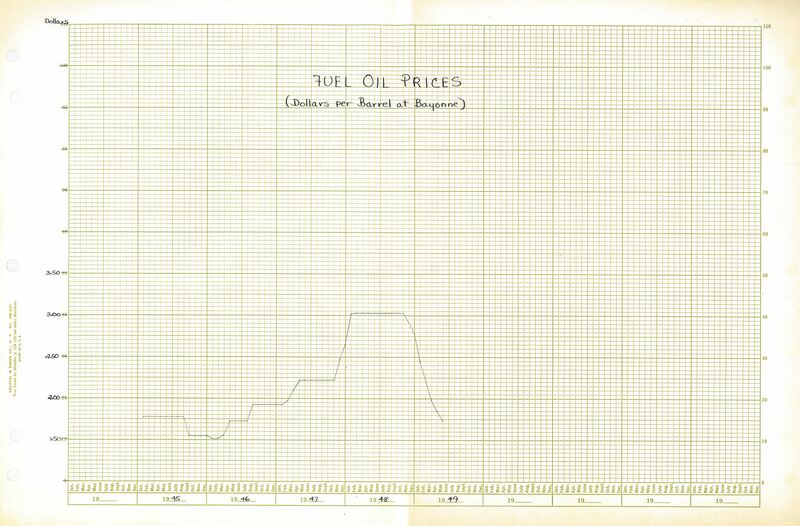 Below is a chart of monthly prices of a barrel of oil “at Bayonne”. For additional information on fuel costs at specific FJP agencies, it is possible to find other data elsewhere in the collection, particularly in the annual agency files, where fuel was generally a line item in the budget.